Emmett “Buzz” Burnam. Pete Comparoni I UK Photo. LEXINGTON, Ky. (Feb. 5, 2019) — If you walk across the University of Kentucky campus and ask someone if they know Emmett Burnam, that person may get a puzzled look on his or her face and say "no." However, if you ask someone if they know “Buzz” Burnam, you’re likely to get a quick nod and a smile, followed by "I sure do!" In the fall of 1969, Emmett “Buzz” Burnam traveled the short distance to the UK campus from his native Winchester, in Clark County, Kentucky, to enroll in classes and compete for the Wildcats on the football field. 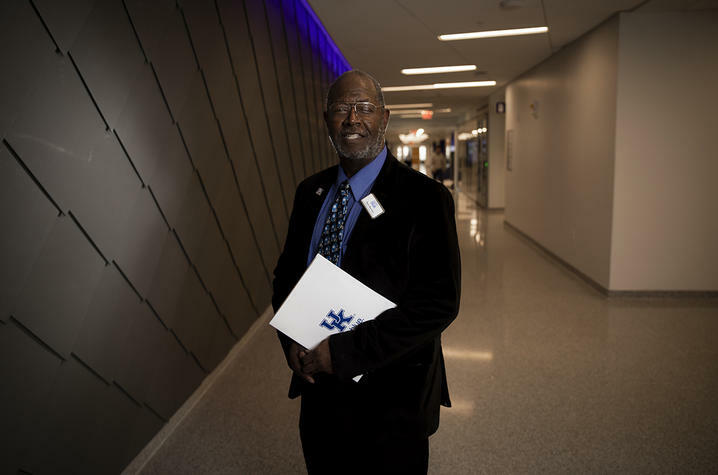 Half a century later, he is a longtime fixture in the Office of Enrollment Management, as director for Diversity Undergraduate Student Recruitment. For this edition of the "Behind the Blue" podcast, UKPR’s Carl Nathe sat down with Burnam to talk about what UK was like when he arrived 50 years ago, what things have changed for the better, and what hopes he has for the future of the university he loves so much.